These days, the illicit thrill of sneaking into a hidden bar from the back of a video store is a mere blip on our adrenaline threshold. 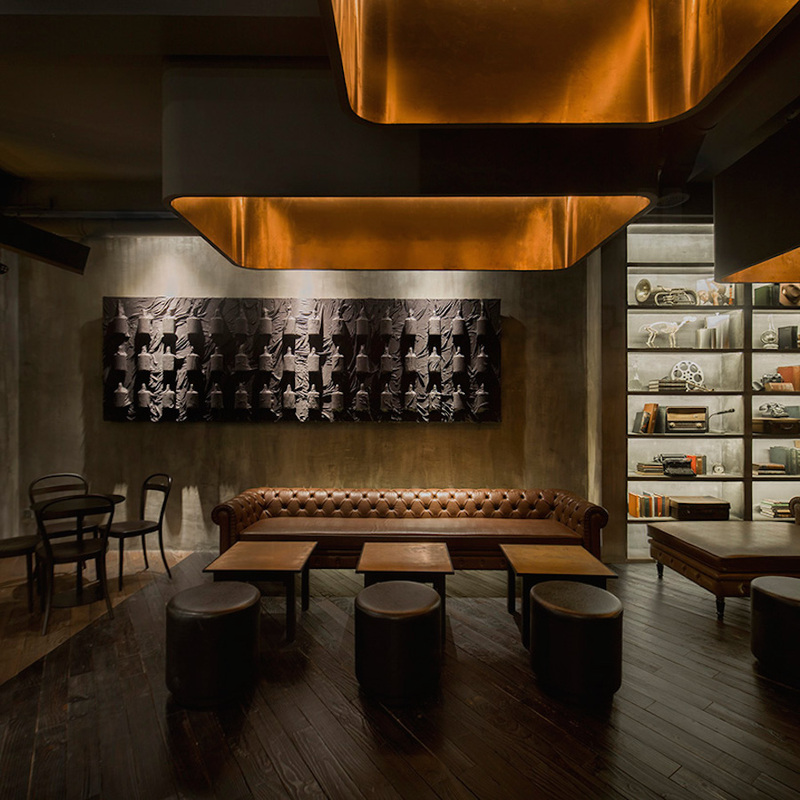 But a new speakeasy in Shanghai aims to reinvent the game with a sleek underground bar concealed behind the innocent facade of a sandwich shop. 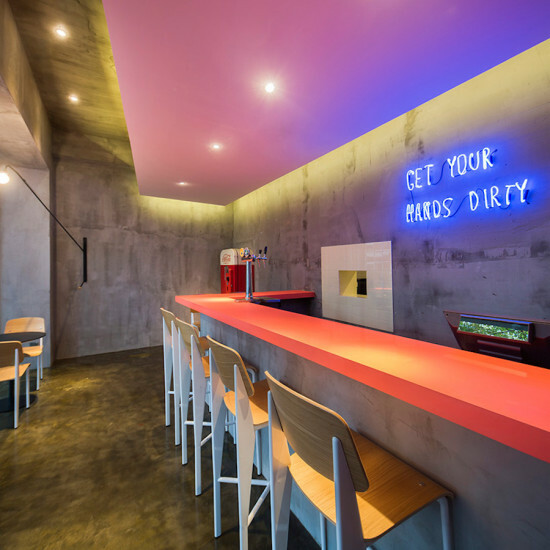 The diner setup is intact, but the glossy countertops in bright shades, neon lighting strips and polished minimalist furniture against unfinished walls emit a suspicious whiff of not-diner. 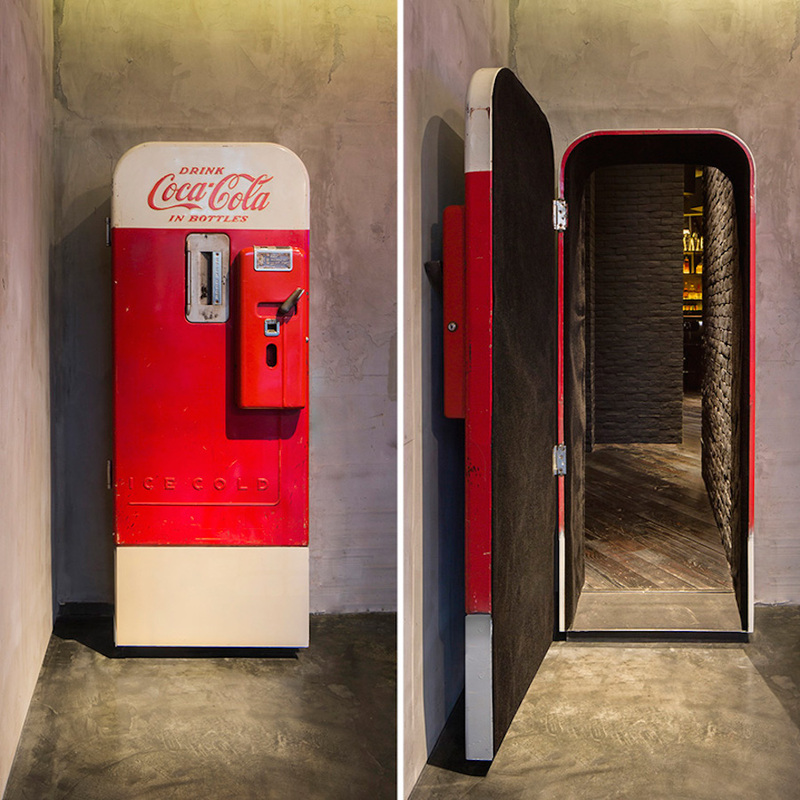 Slot some coins into the vintage-looking Coca Cola vending machine in the corner and it suddenly swings outward, revealing a cooly-lit tunnel and the not-too-distant din of sophisticated chatter. 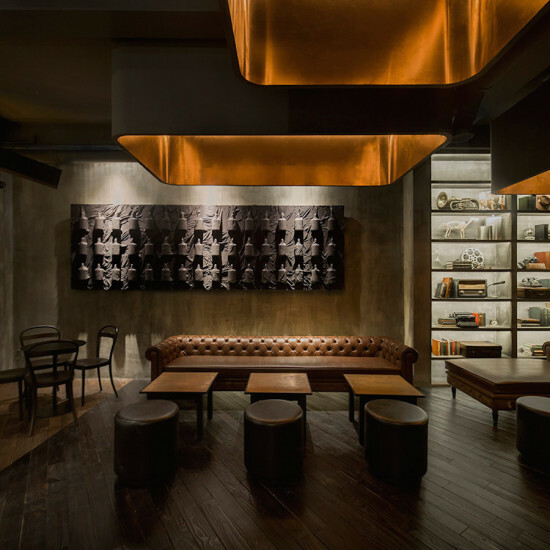 A contrastingly different setting reveals itself: a chic, dimly-lit bar clad in dark tones of black and brown. 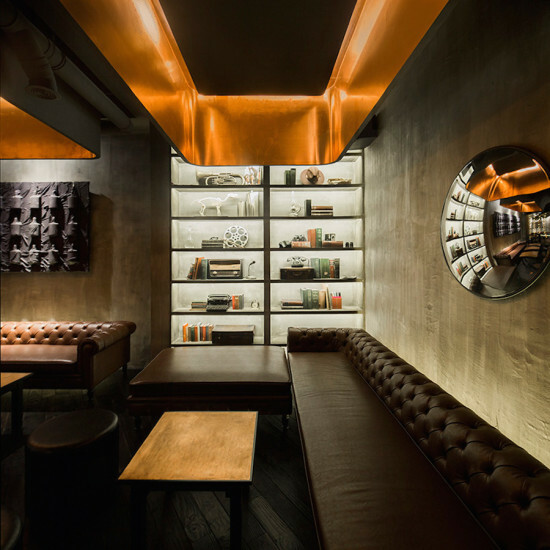 By the entrance, floor-to-ceiling shelving holds bell jar-shaped whiskey bottles, a spotlight beneath each one illuminating the amber liquid within. 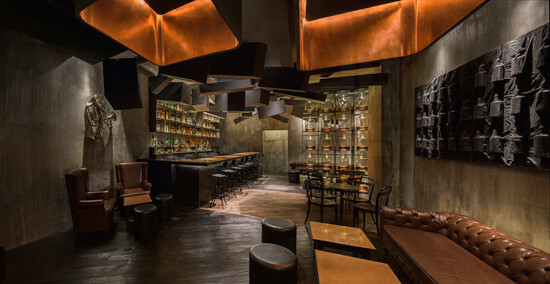 A canopy of copper-inlaid lighting overhead echoes this warm glow, while white LED lights on a slanted plane behind the bar visibly project the liquor bottles outward. The owners of ‘Flask and The Press’ commissioned designer Alberto Caiola to create a mysterious, dynamic setting without feeling too try-hard. “Considering that Shanghai has already seen its fair share of hidden speakeasy-themed bars and lounges, we decided to build suspense and break it in an entirely unexpected fashion,” Caiola told Designboom. Suspended from a wall adjacent to the entrance is an installation of flasks covered by a veil so that only their outlines are visible. Rather than partitioning the seating areas, Caiola juxtaposed chesterfield sofas, bar stools and winged armchairs of different heights to visibly section the space. The wooden floorboards underfoot alternate from dark to light to dark again in keeping with this variation, while cascading cubes suspended from above relieve the low-ceilinged space of stuffiness. 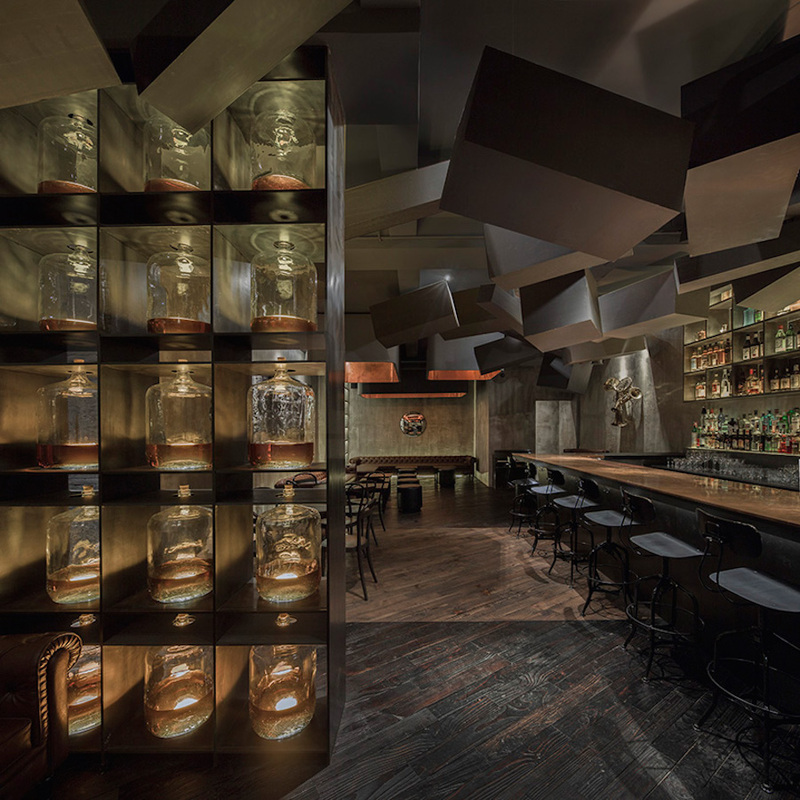 A wunderkind at visibly expanding a confined space, Caiola plays tastefully with convex mirrors and slanted planes to lengthen and focalize.